Felipe Centeno '19 and Niko Djordjevic '21 both try to steal the ball away from a Stony Point player. On Friday, Feb. 8, the varsity boys’ soccer team looked to bounce back after a disappointing 3- 3 draw on Tuesday and to defend their home field against the visiting Stony Point Tigers. A frigid night fraught with rain and sleet proved to be little of a barrier for the Warriors as they put on a dominant offensive show to blow out the visitors 3-1. Head coach Stefano Salerno was able to pull one of his usual starters off the bench and onto the field. Defender Philip Richardson ‘20, who was out for the past several weeks with a knee injury, further bolstered an already hardy Warrior defense which kept the Tigers out of the Warrior’s half for most of the first 40 minutes of play. The only goal of the first half happened in the 17th minute when West Bevins ‘20 found an open shot and slammed one home from 25 yards out. Stony Point came out swinging in the second half and managed to score after just nine minutes on a set-piece that landed in an awkward area within the Warrior goal box. The home team was unable to clear the ball and the nearly point-blank shot slipped past keeper Justin Lang ‘20. 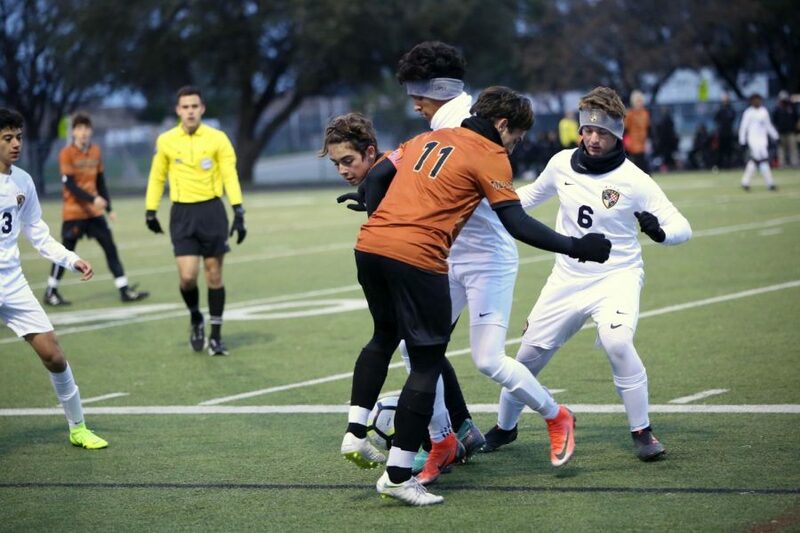 Determined not to replay the events of Tuesday’s game against Leander, the Warriors doubled down and scored again 10 minutes later, when Felipe Centeno ‘19 finished a well aimed cross that was played into the box from the sideline by Niko Djordjevic ‘21. Eleven minutes later, the home team added another goal for good measure when a shot was deflected off the Tiger’s goalie and fell to the feet of Theo Givens ‘20, who easily converted another score to raise the home team’s lead to 3-1. The Warriors will continue their season next Tuesday, Feb. 12 when they travel to Cedar Ridge High School to face the Raiders.